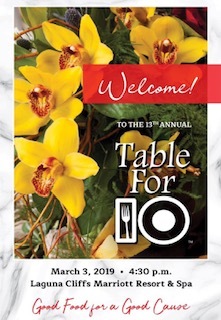 This Sunday, March 3rd, 2019 will be the annual “Table For 10” event held at the Laguna Cliffs Marriott Resort & Spa in Dana Point, CA. A total of 350 guests will raise funds for The Teen Project. 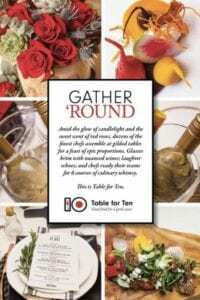 This Table for 10 event is an extraordinary culinary adventure, which showcased Southern California’s top chefs. The optional black tie evening begins with a festive cocktail reception and top-drawer live auction, which showcases “Best of Chefs” dining experiences, luxury goods and inviting trips to exotic locales. Guests and chefs alike are thrilled as the Ballroom doors open to reveal the elegant dining room. Each table is decorated with a different and dramatic theme. With creative one-of-a-kind table-scapes, each chef creates their own special dining experience for the guests and prepares masterful dinner tableside for 10 guests. Exquisite wines are paired with the cuisine, and each table is abuzz with interesting conversation. It is an intimate setting for all. Kristin Martin founded this event over 11 years ago and she is proud that she is able to help nonprofits through Table for Ten. 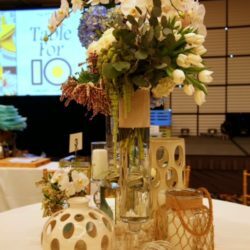 “I wanted to create a unique and amazing culinary event that features top chefs cooking tableside for 350 guests with proceeds benefiting local nonprofit organizations,” Martin shared. She can be quite proud that for the third year running, two nonprofits have been the recipients of the $300,000 generated from these culinary extravaganzas—Vocational Visions (VV) and The Teen Project (TTP). 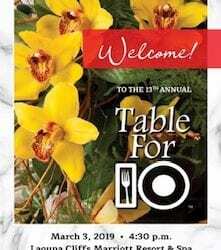 For tickets or more information on how to donate to these wonderful nonprofits, please visit the web site at: www.TableForTen.org . The Teen Project provides teens aging out of the foster care system the resources and support of an intact family in order to allow them to successfully transition to adulthood. To learn more about the work this year’s benefactor is doing in Orange County, visit www.TheTeenProject.com . 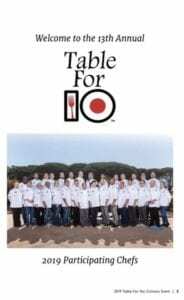 Sunday was the “11th Annual Table For Ten” event held at the Laguna Cliffs Marriott. A total of 340 guests raised over $300,000 for two worthy causes. The event benefits these two groups throughout the year--- The Teen Project & the Vocational Visions organizations.